Fishballs are commonly sold in wet markets in Malaysia especially by the chinese traders. It is usually cooked in soup and tastes delicious when fresh. I prefer those which are springy and “crunchy”. Fishballs should ideally be cooked the same day it is purchased as it usually does not taste as fresh overnight. 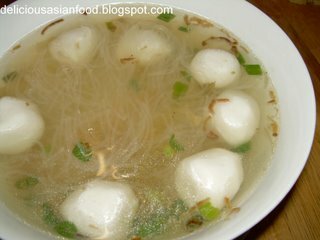 One of the common ways to cook a quick and delicious soup using fishballs is to cook it with Tang Hoon (also known as Glass Noodles). It can be served as an accompaniment to rice or even eaten / drunk on its own. 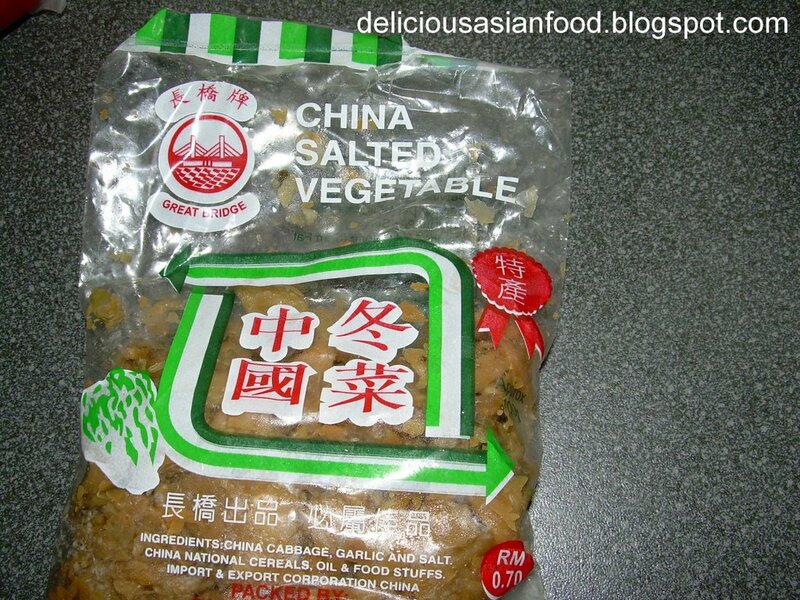 One of the important ingredients which you should strive to add to the soup is chinese salted vegetable as it adds a nice saltish flavour to the soup. 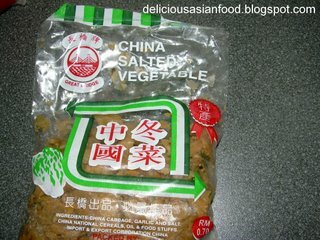 The chinese salted vegetable can be bought from sundry shops. This is a very simple and clear soup to cook which admittedly, might be too amateurish to some. Happy trying if you have not. This is my recipe for Fish Ball Tang Hoon Soup a.k.a. Fish Balls with Glass Noodles Soup. Boil water with ikan bilis for 45 minutes to make stock. Remove ikan bilis when done. Fry shallots in cooking oil till golden brown and place aside to cool. Once stock is ready (which should be at least 1 soup bowl full) and maintaining high heat, add tang hoon and fish balls. The fish balls will float whilst the tang hoon will turn semi-translucent when cooked. Add seasoning to taste. Sprinkle chopped spring onions, pinch of chinese salted vegetables and 2 teaspoons of the shallot oil onto the soup before serving.